Texas Housewife: I Won A Blog Award! Imagine my surprise when I received an award from one of my favorite blogs! Money Saving Pro presented this award to me an I am so flattered! Thank you so much! It's nice to know folks enjoy my ramblings. 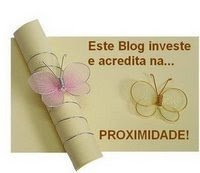 The words are in Portuguese and mean, “This blog invests and believes, the proximity” (meaning, that blogging makes us ‘close’ -being close through proxy). So, I will in turn present this award to eight blogs that I really enjoy. All of them are great reads. These are some of my favorite blogs, written by some fantastic folks. I am so lucky to have formed several wonderful bloggy friends. Six In The Country - Gina is my frugal mentor. I had no idea what coupons could do for my family until this wonderful lady came into my life. Thanks for all you've taught me! Keeping The Kingdom First- Alyssa is another frugal guru. She's even one of Walmart's 11 Moms! I think we were one of each other's first regular blog readers. She has become a good bloggy friend. JANE4girls $800 Annual Grocery Budget For A Family of 4 - Erin is an inspiration! She is awesome at what she does! I look up to her so much and am always learning from her blog. 4 Days In A Week - Becky's blog is one of my favorites. we've "talked" via are blogs and she's made quite an impression on me with that limited contact. Her blog speaks to my heart. You just know she is a kind soul. She probably doesn't know it, but I find her blog a great source of inspiration. She seems to be the kind of woman I wish I could be. Tara's View Of The World - I honestly don't remember how I found this blog, but I'm so glad I did. Tara was someone I could instantly relate to. We have quite a few things in common, so I really enjoy reading her thoughts. She shares her good days and her bad, her triumphs as well as struggles. It's a wonderful, down to earth, honest mama blog. The Adventures of Scarlet O'Kara - I love, love, love this blog! In my opinion she is one of the best mama bloggers in the world! I like how her writing style makes you feel like she's an old friend. She rocks! A Home With A Smile - Another frugal blogger. I love her frugal advice, her garage sale finds, her redecorating, and pretty much everything about this blog! A Year of Crockpotting - Finding Stephanie's blog has been a true blessing for my family. I've always used a crockpot, but generally made just a few basic things in it. Then we moved here and my crocky became our only way to cook. Our menus were very dull until I found this great blog. I never knew how much you could do in a crockpot until now! Thanks so much for helping me to feed my family a variety of yummy, nutritious meals with my crockpot. Each of these blogs has made a difference in my life. They all truly deserve this award. They are a special bunch! thank you, Vanessa! I'm touched---thank you so much for thinking of me. Ok...it is past midnight...I can't sleep because I feel so yucky...and you have to go and make me cry with your sweet words! Now I really will not be able to sleep tonight! Fantastic. You know your worth every award there is for Fantastic Neighbor too! What we having for dinner tonight? Thanks for the kind words about my blog. I told you in my email that I had found and then lost your site to bookmark chaos. I didn't tell you that in frustration trying to find your site, I would say to myself, "Where is that Blue Jean Lady? I know I have her somewhere, here!" LOL Another funny thing is rediscovering the crockpot lady tonight, here, as one you are passing the award on to. Woohoo! She's going to be my winter cooking guide. I look forward to visiting your other friends. Blessing to you and yours. Congratulations to you!! Well Done! Hey Nessa! Thanks so much!! I will catch up on your blog when I get back from Bible study this morning! Your words are very kind and sweet! I think the same of you! Your heart comes across as very sweet and true, one that is working hard to serve your family and your Lord! Awww, Nessa! Thank you so much for your kindness. You are always such a kind heart -- and I am glad to be your friend!